Santa Fe, NM– Chiaroscuro presents its first solo exhibition of the 2017 season with John Garrett’s, Schemes and Dreams. This new body of work expands upon Garrett’s previous mixed media explorations in sculpture, which have always employed the most unexpected and often overlooked materials, transforming them into fine art. Beads, colored wire, video tape, piano washers, bedsprings, plastic cups; the list goes on and on. 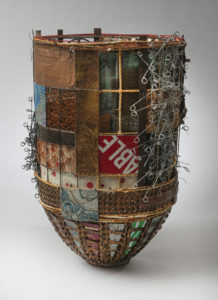 These are the mixed media elements Garrett ties together forming a whole which is greater than its parts. 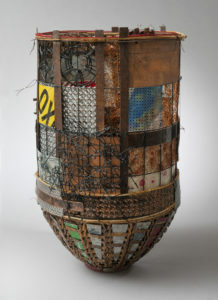 Always a conversation starter, Garrett’s work is constructed with what he terms, “textile technologies.” His meticulous hand-tied, twisted or looped connectors hold together all the elements in his work, and express an abstract and narrative vision for the piece. Garrett explains, “The contrast between rectilinear elements and meandering construction, were of particular interest while creating this exhibition.” Deconstructing the title, Schemes and Dreams, the artist is playing with parts of the artwork that are “planned consciousness (schemes),” and parts that are “un-planned consciousness (dreams).” This dichotomy has always been present in Garrett’s work, but within this exhibition it serves as a central theme. While Garrett is an established artist, always expanding his visual vocabulary, he drew inspiration from fluid lines and brilliant colors of Matisse’s Cut-Outs, and the multiple angles of view first depicted by early 20th century cubist painters. 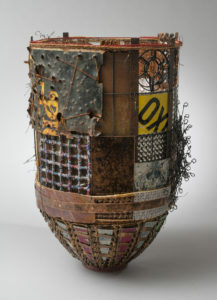 This is John Garrett’s fourth solo exhibition at Chiaroscuro and will consist of just over a dozen major new works, including wall sculpture “nets,” contemporary baskets, and paper collage, all with woven elements.